My name is Andrew I am have been working away at our house over the past couple of years to upgrade and make it more efficient. This web site has many pages showing what we upgraded and in many cases how much it cost. The point of showing this is first to create a chronicle of our activities that we can share with friends; but also to show that energy efficiency can be accomplished in an older house. I hope that by sharing my adventure that I can help other people help make their own energy efficiency upgrade choices. I suggest that you start with the summaries listed by year (links on every page). Then when you find a topic you want to investigate more you can click on one of the ten topic pages. Each topic page has lots of pictures divided into years. The most recent years are at the top - keep scrolling down to see all the years of activity. 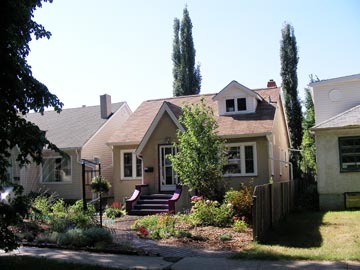 This web site chronicles the renovation of our house and our efforts at energy conservation. Each year we have done a bit more work. 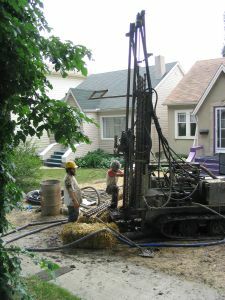 The main construction happened in 2005 when we installed a geothermal ground source heat pump. After that we have continued to work on things and have updates for each of the following year's activities. 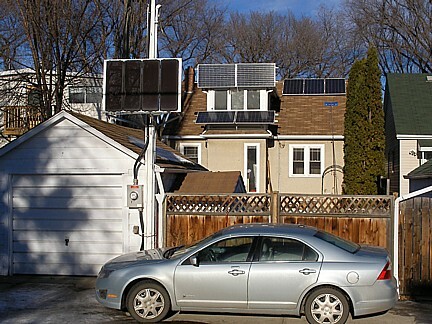 The other really big activity was adding grid-tied solar panels in 2010. The purpose of our renovation was to "recycle" an old house. Our house was built in 1949 and had many problems. Most of the mechanical equipment (furnace, water heater, etc.) was worn out, and we had found a number of faults in the building. The roof didn't have any ventillation and had ice dams in the winter, the windows were drafty, and there was no insulation on the main floor. Although many people think that the way to build green is to start with a new house, my opinion is that we have to figure out what to do with old houses as well. It would have been easier to bulldoze the house and start new with all energy efficient construction, but then you waste the resources that went into building the house in the first place. There was nothing wrong with the structure. The inside also has many beautiful features. Our goal was to substantially improve the building envelope and upgrade the mechanical systems to the best of our ability. This is the story then of our recycling of an old house. I'm often asked if the geothermal heat pump will pay for itself. It's more complicated than that. Our house needed the insulation, new roof, electrical upgrade, windows and doors, and water heater anyway. How much should we include in the calculation of paybacks? A better answer is to look at what was spent. We upgraded our house for about $65,500. This meant we avoided tearing down this house and building a new one. That kind of activity would have cost us $200,000+ and would have sent the tons of materials in the old house to the landfill. We wouldn't have been able to afford that type of rebuild anyway. So how did we do on the recycling? The best way to answer that is to quote our Energuide scores. When we started our house rennovation our house received an Energuide score of 39. This is a very low score typical of a drafty old house with an inefficient furnace, no insulation, and air leaks all over. When we were done we had an Energuide score of 79 which is the equivalent to a new house. Most Energuide scores increase by 15 to 20, we increased by 40 points - the engineer that calculated our heat loss had never seen such a large improvement. So over all we were successful in recycling our old house. We spend less than half the amount on heating than before the rennovation. 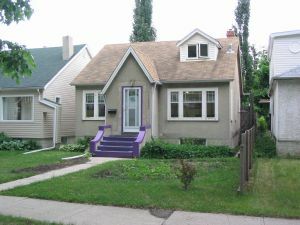 We may not see a specific payback anytime soon but it was sure cheaper than moving to the suburbs or rebuilding this house from the ground up. If you are wondering where to start looking on this web site I suggest you start with the geothermal page. That got everything started back in 2005. It also drove a lot of the other renovations. This site is mostly pictures and commentary organized by subject. Pick a subject that interests you and start from there. If you would like to ask questions you can send me an email. My email address is hidden in a script. Click my name below to send me a message. If you don't see an email address when you mouseover my name then you have disabled scripts on your browser.